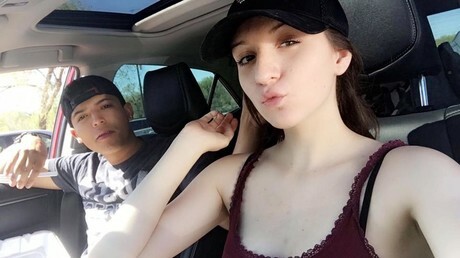 A 20-year-old Minnesota woman has pleaded guilty to shooting her boyfriend in a bizarre YouTube stunt that claimed the life of Pedro Ruiz III in July. Monalisa Perez, 20, pleaded guilty to second degree manslaughter for her involvement in the death of her boyfriend while the couple were filming a video for their YouTube channel. Perez, who was heavily pregnant at the time but has since given birth to the couple’s second child, shot Ruiz III with a .50-caliber Desert Eagle pistol at point blank range. Ruiz III was holding a hardcover encyclopedia against his chest, the bullet went through the book and into his chest, killing him as two cameras rolled. The couples young daughter was playing near-by at the the time. Hours before the shooting, Perez ominously tweeted that she was going to perform a dangerous stunt, adding that the idea was Ruiz III and not hers. At the time Perez told officers her boyfriend had been urging her to partake in the video for a while. To convince her, Ruiz III had shown Perez a different book which was not fully penetrated by a bullet he had shot. As part of a plea agreement Perez will serve six months in prison, spread out over three years. She will then, according to local media, become eligible to serve her remaining sentence of 10 years on electronic home monitoring. Perez is also barred from profiting from the video and is banned from possessing a firearm for the rest of her life. She is expected to be sentenced next February.